After attending this year's World Outlook Conference in Vancouver this past weekend and hearing Mark speak for the third consecutive year I am convinced that his insights are invaluable. I like the VRtrader Platinum better for what we do in it--IN and OUT quickly making profits. For the moment, the VRtrader is exactly what I need. Should I change my mind I will let you know. Thanks for the excellent service! As far as I'm concerned you're the greatest out there in regards to timing markets and metals with a high level of accuracy, integrity and truth in calling it like it really is in a very broken and greed ridden (free?) marketplace and (free?) government. In a lot of ways you remind me of my dad who since I was a boy frequently said "someday greed will ruin the world". He would stand tall in his beliefs, although they were very unpopular back then during the "good times"...Stay strong in your conviction and keep ringing the truth. We love ya!!! Thanks again and best to you! Excellent call, just minutes before the 'Gang of Six' senators reached their deal and gold and silver plunged! I am very impressed with your Volume Reversal ToolKit. I'm a better than when I first subscribed, and you an take credit for some of that. 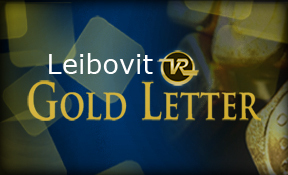 Hello Mr. Leibovit: Just want to thank you again for your incredible work. I have made your recommended ETF trades and as well the stock recommendations and have paid for my subscription many times over. I know "thank you's" in this business are rare and just wanted to let you know I greatly appreciate what you do. Great work! Thanks for the UUP pick from a couple of weeks ago. I went in when you called it nea the $24 level with a significant position as I strongly agreed with your analysis and it has worked out very well thus far with a nice profit. Just a thank-you for getting us out of the market before this last crash. Very impressive Cheers. Keep up the good work. Thanks to you I might be able to retire when I planned to. I am 55 and plan to retire at 60. Do not worry if you error because I always am 50% in cash unless there is a screaming buy. I think you're a great market forecaster and I see real genius in your thoughts. You should write a book! There are only a few people that I respect and read to hear their thoughts on topics (5-6 people maybe). And, you have made it on that short list for me. Good day, Mark. I am enjoying your newsletter. The best compliment I can make is to say I am learning from you and I really enjoy learning. One important lesson you are teaching me is don't be afraid to sell and, as you say, 'ring the cash register' and take a profit and also to take a loss quickly if necessary and move on before more damage is done. Thanks for your analysis. Had my membership with you been active at the time and I'd taken your general adice to 'clear the decks' on Monday, I'd obviously be MUCH better off (: Chalk it up for learning. BTW, I appreciate your frequent analysis of all aspects of the markets. Dunno how you manage to do that with such depth and frequency, but just thought I'd let you know it's appreciated. I signed up for your half-price offer five days ago, and I'm already hundreds of dollars richer as a result. I find the Volume Reversal T listing really helpful in narrowing the field. From there, I examine the charts, etc. and make my picks. My success rate has gone up substantially in the past few days thanks to your service. Keep telling it the way it is..as NO ONE else does in this industry!